in a makeshift bed in a school changing room. from behind a clothing rack in the room. when they were caught on January 5 this year. going to lose my job", legal documents seen by news outlet WFSB show. month on a classroom couch. assault and two of risking injury to a child, court documents show. 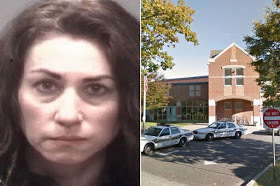 0 Response to "Sèx Scandal:Female Teacher Caught With A 15-Year-Old Pupil In Bed In The Dressing Room"